Hashchain Technology Inc (TSXV: KASH) is the new kid on the block when it comes to stocks within the blockchain and cryptocurrency sector. After several months of work, the company finally had their initial public offering and commenced trading on December 18, 2017. This was done with much fanfare and Hashchain was certainly the talk of the twittersphere and other online communities for the weekend prior. This hype was evident on the first day of trading for the company. Although it was slated to begin trading at a price of $0.15, as indicated in a document signed on October 24 and uploaded on December 12 to SEDAR, that was not the case. As a result of the hype generated over the prior weekend, it opened up at $2.77. As if this wasn’t difficult enough to believe, it momentarily touched a high of $4.40 – within the first fifteen minutes of trading. Ultimately, Hashchain Technology closed its first day of trading at a price of $2.45. The company was halted on the morning of what would be its second day of trading. It remained halted throughout the day, with news being released after market close. On its second day of being public, the company announced a bought deal for $26 million. The private placement was announced the day after Hashchain was first publicly traded. The raise itself consisted of units being offered at a price of $2.10. Each unit contains one common share, and one full warrant with an exercise price of $2.45 for two years following the close of the transaction. 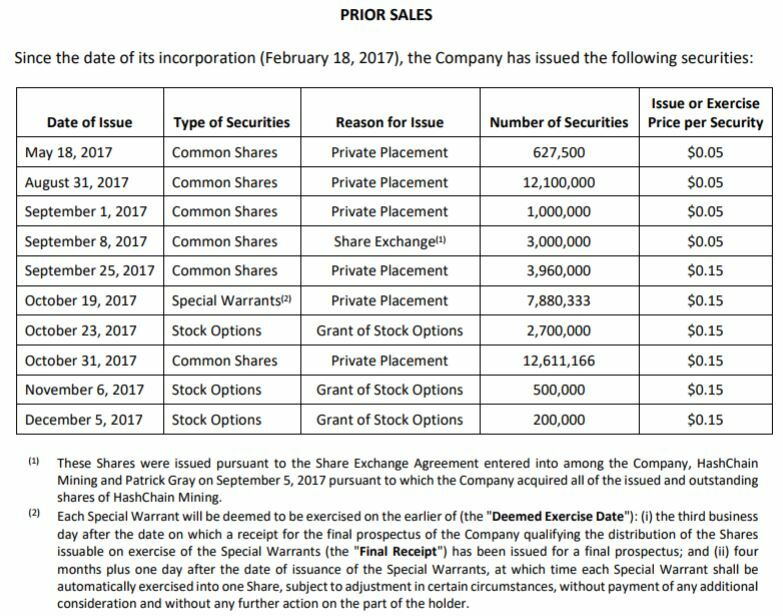 With the bought deal being valued at $26,000,000, it results in approximately 12,381,000 shares being added to the company, with an equal amount of warrants. Further to these figures, there is also an over-allotment option available. This would result in up to an additional $3,900,000 being raised. Additionally, there is a forced conversion clause related to the warrants. If the price of the security exceeds $4.00 for a period of ten days the company can elect to force the conversion of these warrants. However, this clause cannot be enacted until after the four month and one day hold period is expired. The raise is expected to close by January 4, 2018. Speaking solely to the ethical nature of this bought deal, the timing is very suspect. After a single day of trading, the market is not able to assign an appropriate price to an equity through the process of price discovery. Rather, this first day is always filled with hype and high expectations. It doesn’t allow for a base line to be set for the stock. This is evident based on the range between the high and low experienced on December 18. A low of $1.50 was set, while it also hit a high of $4.40. This directly indicates that the market has not had sufficient time to properly price the equity. Furthermore, it is very easy for manipulation to occur within the first day of trading if it is intended that a raise will be completed the following day. As a result of it being the first time the shares are publicly available, insiders and those close to the company are able to easily manipulate the share price if they so desire. For instance, if few shares are made available by those close to the company, a small level of demand can easily push the price higher. One of the benefits of researching a company that has freshly gone public, is the trove of up to date data made available on SEDAR. Whereas in a reverse takeover transaction details can be extremely cryptic, in an initial public offering things are pretty cut and dry. For the details related to Hashchain Technology’s share structure, we simply consulted the long form prospectus filed on December 12, 2017. Hashchain Technologys current share structure as of December 19, 2017. As can be seen above, current shares are being held at rock bottom prices. Based on the rates at which all current shares were obtained, the initial investors of the company are making some serious returns. This recently announced bought deal is offering units to investors at fourteen times what previous investors paid. For investors that took place in the mid September raise, this raise is forty two times what they paid just three months ago. Lets phrase it this way to put things in to context. The $50,000 raised on September 1st by issuing 1,000,000 shares at a price of $0.05, is now worth $2,100,000 at a minimum. Or more recently, the 200,000 options issued on December 5, 2017 had a value of $30,000 when they were issued. Two weeks later, those options now contain a value of $420,000 based on this bought deal. If this doesn’t stink to investors, we’re not really sure what will. Based on the current 41,179,000 shares outstanding, Hashchain’s market cap would be $86,475,900 at the price of the bought deal of $2.10. Factoring in the additional shares from the deal would bring the market cap to a total of $112,476,000. It has been noted that since the time of this news release pertaining to the bought deal, there have been some comparisons being made. The primary comparison, is between that of Hashchain Technology and HIVE Blockchain (TSXV: HIVE). Within this example provided by many users across internet communities, it is stated that Hashchain did the same thing that Hive did: they announced a financing immediately after going public. This is a half truth. 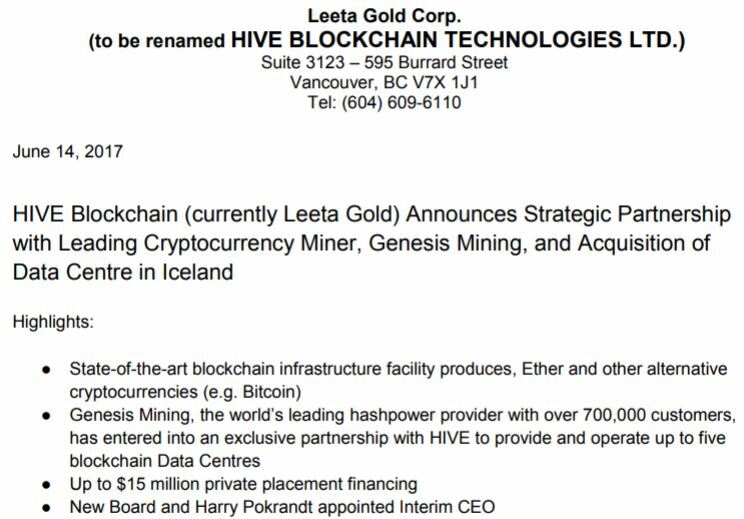 HIVE Blockchain’s initial change of business announcement. Note that the financing details are issued within the same news release. There is a wide difference between the two companies. As can be seen above, Hive concurrently announced the change of business and the related financing. This was conducted within the same news release, and the raise was conducted at a level relative to the current share price of the company. Comparatively, Hashchain went public, let the stock move on hype for a day, then subsequently conducted a bought deal before sufficient price discover could occur. These are two wildly different scenarios that cannot be respectfully compared. At the very least, the timing of this raise conducted by Hashchain Technology’s was not done in the interest of new investors. Instead, it was done in the interests of the initial shareholders of the company who have been overcome with greed. The last time we saw a similar scenario, although much more drastic, was Cannabis Wheaton Corp. Investors punished the stock for ages after it was realized the profits the management had cut out for itself. A similar scenario might play itself out here. We are by no means doubting the future potential of the company, lets make that clear. Rather, we are pointing out the ethically questionable actions by management that were conducted in self interest. The company itself may very well become successful based on the current transactions that are in play. Mining of coins is one of the more straightforward and easily understood concepts within the blockchain sector. it offers high gross margins, and requires minimal input once established. It truly is an excellent business concept. When we first heard about Hashchain Technology and read what information was available, we had high hopes for the company. It’s Canadian based, has already established operations, and offers excellent margins. However, even the best business plans can fail with poor actions by management. Price discovery is crucial for newly listed equities. Know the basis for this pricing. Dive Deep. Information for this analysis was found via TMXMoney, SEDAR, SEDI, HIVE Blockchain and Hashchain Technology. The author has no securities or affiliations related to this organization. Not a recommendation to buy or sell. Always do additional research and consult a professional before purchasing a security.